The words of the Indian Air Force chief seem stark in headlines on the front pages of Times of India, Hindustan Times, The Indian Express and The Hindu, especially as HT points out that “BJP president Amit Shah said that 250 terrorists were killed in the air strike” just two days ago. Express writes that this “first public remarks on the February 26 air strike” by figure of authority follows it Saturday report quoting “a top government source” who said “limitations of technical intelligence and lack of ground intelligence at this point make any assessment of terrorists killed in the attack ‘purely speculative’”. Apart from Dhanoa’s remarks, the newspapers focus on different aspects of the report: HT highlights the political storm over the airstrike in its lead report, “Oppn chorus grows for proof of air strike in Pak”. “Claims and counter claims by the government and Opposition sent temperatures soaring…” as Congress asks why “the government was not providing details of the casualties inflicted in the air strikes on JeM” (HT). 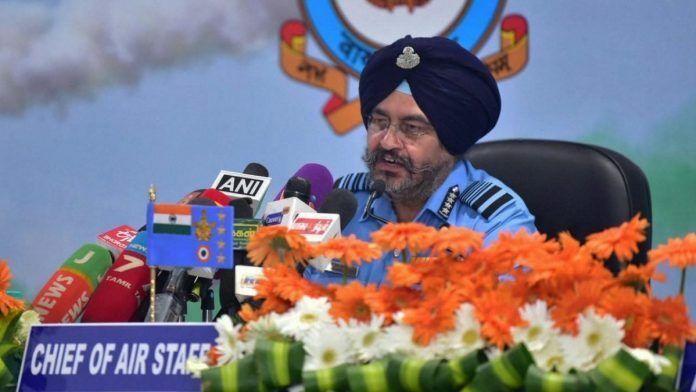 “All this came even as IAF chief B.S. Dhonoa steered clear of a question on the number of casualties, the core controversy,” the report continues. TOI, Hindu and Express ignore the opposition on page 1. Express and Hindu give play to PM Modi’s Ahmedabad rally speech where he “warned that India would hunt down terrorists wherever they may be hiding” (Hindu). Express focuses on the PM’s personal remarks in “Will take fight against terror into its home…I will settle all scores”. TOI and HT carry the PM’s comments on the inside pages. Similarly, HT and TOI don’t carry the “Pakistan government on Monday passed an order to effectively ban Laskhar-e-Taiba offshoots Jamat-ud Dawa and Falah-i-Insaniyat Foundation” (Hindu). Pakistan was acting on a UNSC order to implement sanctions against designated terrorists and terrorist groups. Express adds in its ‘Explained’ box: “The test is what does Pakistan do on the new move to blacklist Masood Azhar” at the UN and its “action against the Jaish infrastructure in Bahawalpur. Until then, global pressure will build on Islamabad”. Express’s “Heard huge explosion, soldiers evacuated us: Jaish madrasa student in Balakot told relative” claims to have learnt details of the IAF airstrike “from a relative of a student present in the madrasa at the time”. According to him, the Pakistan Army evacuated students from the JeM madrassa hours after the attack, “and kept them in a safe house before sending them back to their homes”. “…soldiers had been providing security to the Jaish facility for a week or so before the strike,” the student reportedly said. On the number killed in the attack, Bhaskar claims that official sources for the first time have claimed that there were 300 active mobile phone connections in the area where the air strikes took place. Most comment Tuesday centres on the politics over Balakot with Economic Times, Business Standard and Express addressing the issue. In “Grain and Chaff in Balakot Strikes”, ET writes, “Nitpicking is for nits… look at the big picture”. “Quibbles,” it adds, are being “aired” by political parties on the “precise number of terrorists killed”. What is undeniable, it says, is that India called “Islamabad’s nuclear bluff” which marks a “paradigm”, “regardless of how many people were killed in the strike”. This took “political will” and “to talk of it to quench the bloodthirst of TV studio warriors is profane”, concludes ET. BS disagrees with ET in “Off Target”. It argues that India’s “diplomatic victory” rests on its “vibrant democracy”. The government is “liable to be questioned by its citizenry’, so its “proclivity” to equate basic and obvious questions’ on the airstrike “as anti-national”, is “wide of the mark”. To treat questions on the IAF “hit” and the number of casualties as “criticism of the Indian military is even more off target”, it argues. Instead of “providing corroborative evidence”, the government is “enmeshed in emotive election rhetoric”. Worse, it argues, the only person to put a figure on casualties is Bharatiya Janata Party (BJP)’s president Amit Shah: “…why is party functionary” making such claims when the government has not confirmed is a “mystery”. It urges the government to “provide facts”. The Balakot strike continues to dominate the air waves. The debates turn more political each day: government claims many terrorists died in airstrike, the opposition asks for evidence to counter international media claims of little damage at ground zero. On News India, the Hindi news channel, the anchor repeatedly asked BJP spokesperson Sambit Patra how the BJP president arrived at a figure of 250 terrorists killed in the attack. Patra replied that approximately 300 cell phones in the Balakot base area were functional before the attack — “they stopped” after the attack. The anchor said he accepted Shah’s figure but how did Manoj Tiwari (BJP) claim “360” were killed? Patra switched tack and argued that no matter how many were killed — even 400 — everyone should “celebrate”. India Today’s anchor Rajdeep Sardesai wondered why BJP was playing with numbers like a cricket scoreboard. On CNN News 18, a discussion on Pakistan’s failure to crackdown on terrorist groups, saw panelists stress the need to avoid politics. On Republic TV, the debate turned to the International Cricket Council’s refusal to ban Pakistan. The Board of Control for Cricket in India (BCCI) had urged ICC to sever ties with countries which harbour terror — it did not specifically name Pakistan in its letter.